A small resto bar once adopted a brand name, spent a ton of money in marketing and promoting its brand on social media, only to receive a Cease & Desist Letter from a retail giant, which alleged that the former had infringed on the trademark rights the retail giant had over an international clothing line brand name. Similarly, Zomato, which is today a popularly known restaurant search and discovery platform, was once called Foodiebay and, received a Cease & Desist Letter received from eBay alleging a similarity in brand name. This proves that many companies, no matter how large or small, could receive a Cease & Desist Letter, relating to intellectual property violation. Is this something to worry about? Not really. Let’s first understand what the Letter means, and what power it holds. A Cease and Desist notice is nothing but a letter sent by a company or its attorney, to another company, citing that it has violated a certain IP, with citations and proof of the said violation, thus informing the receiver that they have to cease the activity and desist from continuing it in future. 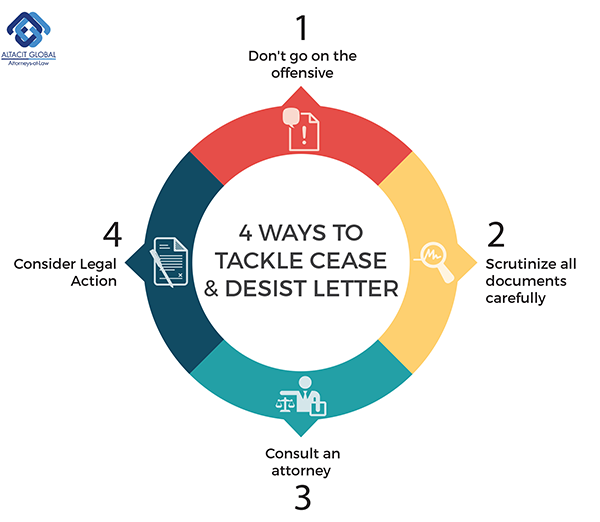 A Cease & Desist letter’s contents have to be evaluated to assess the validity of the claim. Often times, there have been cases when companies have sent these letters merely to intimidate a smaller company. So, what can an entrepreneur or a businessperson do, when they receive such a letter? Understand that a Cease & Desist Letter is merely a first step towards informing the receiver about a certain IP, with valid proof backing their claim. Hence, there is no need to go on the offensive and react negatively to the notice, such as sending an ill-informed mail or ignoring it altogether, which may harm you and your business. Now that you have received a Cease & Desist Letter, examine the document carefully to ascertain the validity of the claim. For example, if the letter claims of a trademark violation, analyze records to see if the company, in fact, has a registered trademark or has filed an application for registration of the trademark, whether it had filed it before or after you adopted it and so on. It is also essential to analyze the prosecution history of the claimed IP to ascertain whether any right has been given up during the grant of the IP. This will give a better clarity on the claims made in the document. If the claims in the document are valid, consult an attorney to frame the future course of action. Typically, a Cease & Desist Letter could either be a minor claim that can be negotiated directly by both parties and resolved, can lead to the sender demanding as damages that revenues earned under the IP be directed to him/her, a lawsuit or more. While the Letter per se cannot mean harm at the initial stage, if you ignore it or fail to respond to the Letter, the sender may be required to take any other necessary legal action. Hence, it is advisable to go through the letter carefully and take the help of your attorney to take the right legal steps to tackle the issue. In certain cases it would be advisable to file Caveat Applications in appropriate jurisdictions to ensure that no ex-parte injunctions are granted that can bring the business to a stand still. If the claims are not valid or are intimidating in nature, one could consider a Suit for Groundless threat of infringement, seeking to restrain one from making intimidating threats.